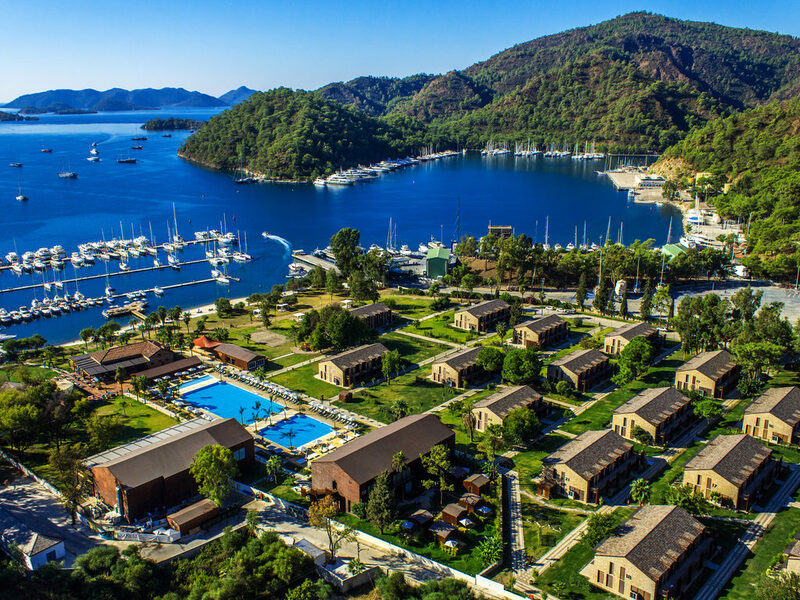 Situated in a natural reserve in the heart of Gocek, Rixos Premium Göcek offers you a retreat featuring the typical characteristics of the Aegean Sea. At a 20 km distance from the Dalaman International Airport, the resort comprising 192 elegantly designed suites offer its guests the opportunity to relax amidst the natural beauty of evergreen pine forests, tranquil gardens, secluded beach, and at the Anjana Spa. The hotel combines stunning natural beauty with restorative peace and tranquillity. Located in Village Port. The main restaurant serves open buffet breakfast, lunch and dinner. Called the "Cuisine of the Sun", the Azure restaurant is a secluded and comfortable place reserved for our guests where they can enjoy light and tasty salads, sandwiches, wraps, pizzas and burgers at lunchtime. Stop in our casual all day dining restaurant for a captivating array of flavors from all over the world. The dinner theme is based on succulent Turkish Aegen mezzes and daily fresh seafood from the fertile Med- Aegean sea. Rixos Lounge is a uniquely lobby bar and tea lounge. Live music performance in the evenings. Nargile garden is the ultimate place to chill and relax in the nature under the evergreen pines, smoking a fruity aromatic nargile (hookah/shisha) while tasting the tea from a samovar with crisp authentic baklava. Located in Secret Beach, serves refreshing cocktails, smoothies and cocktails.